The kids are back to school and it’s time for another book art project with my partner in bookish awesomeness, Ana from Babble Dabble Do. As you know, I try to encourage my kids to exercise their writing skills in playful ways, including using journals for fine motor work, or making a hobby book. 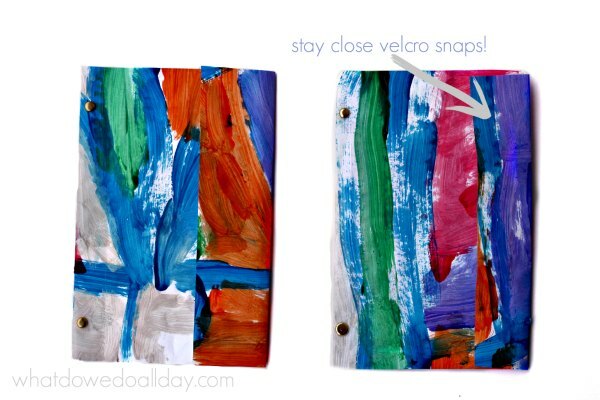 Ana has created a very simple bookbinding project for kids that will also help you upcycle all those gorgeous pieces of art they have been creating on a daily basis since they were old enough to wield a brush. The other thing I like about it is that I could use up pages from all those half empty composition notebooks I have lying around! One crafty note: I used brads to bind the books, but Ana used a different method. I won’t give away Ana’s secrets, so you’ll have to head on over to her post to get the full instructions (super easy, I promise) after you take a look at what we created. Although this project is intended to be a kid-made journal, I actually did it by myself. There are two reasons. The first is that if I had attempted to upcycle art my kids in front of them, they would have thrown a fit. No matter that the artwork has been collecting dust in the back of the closet for 3 years! It becomes precious when mom decides to mutilate it. You all know what I am talking about. However, if I do this all behind the scenes, no one cares in the least. Second, I plan to give these journals to my kids as gifts. A handmade journal makes a great gift, don’t you think? Of course, I would never leave you with a book art project without including some inspiring books to read! Check out the selections below. 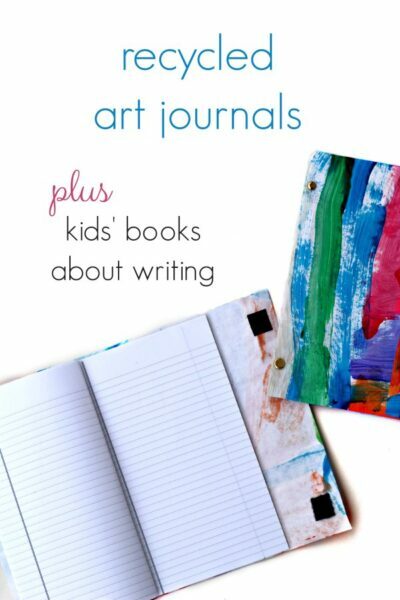 You can also take a look at my favorite writing journals for children. Moxy Maxwell Does Not Love Writing Thank-you Notes . Plucky Moxy has to write 12 thank you notes in order to get permission to attend a star-studded Hollywood bash. Instead of simply sitting down and writing them, she concocts a clever, but sort of complicated plan that goes awry, but it is for a different reason entirely that she must miss the anticipated party. There is some good humor in this book and I like how the non-traditional chapters can give kids an example of how writing stories can be creative. Hilarious. A Beginning, a Muddle, and an End: The Right Way to Write Writing is the sequel to another book, The End of the Beginning, and even though it is a short chapter book I think the concepts are sophisticated enough that I would recommend it for ages 8 and up. The word play and puns also keep the target audience firmly in the upper elementary age group. The story follows Avon the Snail as he attempts to write a story. He struggles a bit but gets some help from his friend Edward the Ant. Together they tackle big questions about writing, such as, “what makes a good story?” Charming. Katie Woo: Star Writer . Katie Woo is spunky Chinese-American girl who is the heroine of about a gazillion early chapter book series. In the “Star Writer” series, Katie tackles a different kind of writing in each book, from writing fiction, to journal writing and poetry. These book are a sort of hybrid between storytelling and non-fiction, with tips and tricks about writing in the sidebar. Fun. Harriet the Spy . Don’t forget about this classic book about a girl who keeps a spy journal. When her journal is stolen and her peers learn about the unflattering things she wrote about them she finds herself an outcast. What makes Harriet so wonderful is that she is a real person. She is not always (maybe not even often) pleasant to everyone, she makes mistakes, but she is smart and resourceful. Awesome. The School Story . Andrew Clements excels in the “chapter books about school” category and so it was no surprise when I discovered his book about writing. 12 year old Natalie has written a manuscript and since her mother is a publishing agent it seems natural she would ask for her mom’s help in getting published. Natalie doesn’t want to ask her mom for special treatment so her friend Zoe convinces her to submit it under a pen name. This is a really wonderful book, with a plot that will keep kids turning pages as Zoe and Natalie navigate a grown up world while trying to maintain their secret identities from people they know. Delightful. I’d love to hear from you. Are your kids writers? What do they like to write? How do you encourage them? Oooh, I that journal idea is just the thing we needed to collect observations for our science fair project. I was looking for something personal and fun. I’ll definitely try it out. My daughter and I enjoyed the word play in the Avi book. Definitely going to check out the Katie Woo series, sounds great!